When Pastor Joe Talemaitoga arrived at the Fiji Mission office in Suva as the new chaplain for Adventist young people, he was told that his top priority was to establish a church/evangelistic center to serve the many students attending the University. Fiji lies in the center of the South Pacific islands. The capital city, Suva, is home to several international institutions of higher learning, including a university, a medical school, and a technical school. These schools attract the brightest students from throughout the South Pacific. Some 500 Adventist students are enrolled at these schools. They have come to prepare for leadership roles in their own countries. But until recently there was no Adventist church nearby, no place where these youths could come to worship and bring their friends to fellowship or study in a welcoming atmosphere. For a while the group rented a hall at the university in which to worship, but increasingly the university needed all of its larger halls on Sabbath morning for lectures, leaving the Adventist students with no place to worship. For some, it became too much trouble to find a church, so they stopped attending. But thanks to your generous support of the Thirteenth Sabbath Offering, that scenario has changed. This is the miraculous story of how the Pacific Tertiary Evangelistic Center (PTEC) came to be. 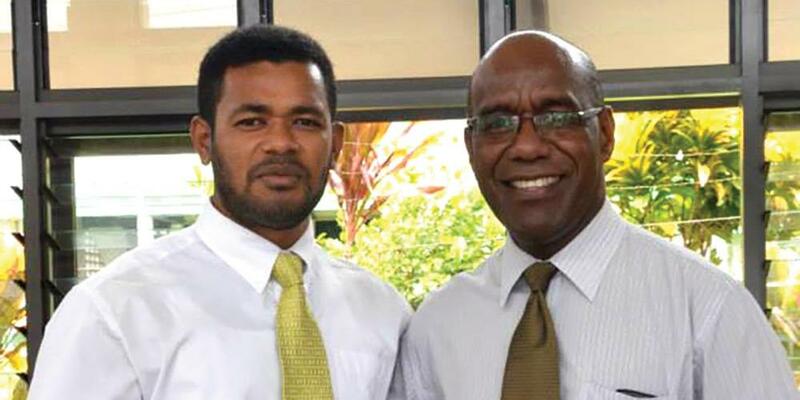 When Pastor Joe Talemaitoga arrived at the Fiji Mission office in Suva as the new chaplain for Adventist young people, he was told that his top priority was to establish a church/evangelistic center to serve the many students attending the University of the South Pacific and surrounding educational institutions. The funds were available, but on an island where land is at a premium—especially in the capital city of Suva—church leaders had not yet been able to find anything suitable (and affordable) near the university. One evening Pastor Joe and other mission leaders, along with several Adventist student representatives, met in a classroom on the university campus to consider a short list of available properties. None of the properties were ideal, but the group voted to purchase a steep block of land located about 2 kilometers (1.2 miles) from the main university. It was after 10 p.m. when everyone left. As a group of students from the Solomon Islands walked along the street, they noticed a car stop in front of them. A man jumped out, ran up to a fence surrounding a large house sitting on a prime piece of property, quickly posted a “For Sale” sign, and left. “We should tell our chaplain about this,” they said. At 7:30 the next morning Pastor Joe’s phone rang. He listened as an eager student described the property and its prime location. Thanking the student, Pastor Joe phoned the number on the sign at 8:00 a.m. Right after the call, Pastor Joe went to see the property. It was perfect. Located on a gentle rise just two blocks from the university and directly across the street from the largest cinema and shopping mall in Fiji, the pastor couldn’t imagine a more visible and accessible location. He immediately called the real estate company again and told them he was coming in to discuss purchasing the property. Clearly, the man’s life had been positively impacted by his experience at an Adventist primary school. “I’m going to call the owner of our company now,” he said. The pastor was silently grateful to the girl who had invited this man to church. “So, why do you want to buy this property? For what purpose?” the owner asked. “For a church for young people,” Pastor Joe replied. “Not for an investment?” probed the owner. No problem, thought Pastor Joe. We have the money from the mission offering sitting in the bank.